Underground homes have many advantages to those built on the surface of the ground; as the earth stays at a constant 55 degrees Fahrenheit or 15 degrees Celsius about 5' down (1.6 meters) then it only needs a few degrees of heating for humans to be quite comfortable. They are quiet and snug, not dank and gloomy like a cave, which is generally how the uninitiated imagine them to be. The materials are right on site; soil after all is an abundant resource, and in this case, it's preferable to use subsoil rather than organic top soil. 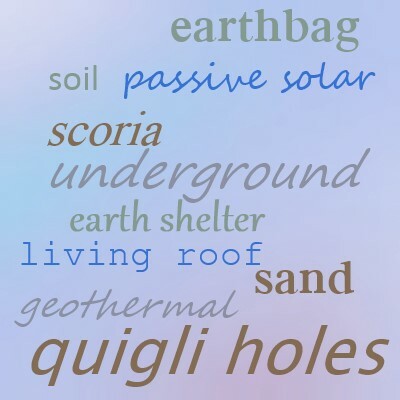 An underground house can take many forms; an earthship, with a bermed north wall, or an earth sheltered home, with the lower floor built into a hillside, and the top floor rising above it. It's easy to incorporate passive solar design into a house that is built into a hill, with south facing windows exposed to the suns rays. Designing a house that will be built underground takes a bit of thinking outside the box; skylights or suntubes may be important to add daylight to areas that might not have a window. Shuffling the living space around to give the areas that get the most use – the kitchen and living room – the pride of place in the brighter and sunnier southern exposed side of the footprint. Areas that don't require full sun, such as bathrooms, bedrooms and storage closets can be in the rear or northern part of the house. Domes are a common way of building underground. There are many habitats that lend themselves to this design, especially where the climate is cool in winter but doesn't tend to be very snowy. Groups of round pods, each joined by passageways to the others can be a unique and interesting way to live. In British Columbia, the need exists to provide warmth in winter, and cool in summer, and in the shoulder seasons, spring and fall, easy access to the outdoors is important. A barefoot house is where the indoors and outdoors meld together, making it hard to tell where one ends and the other begins; patios and decks are another living area, within reach of the inhabitants, only steps away. The native peoples lived in exactly this type of situation, in round dug outs, with a roof over top. This is earth sheltering at it's finest, even hundreds of years ago. The pits, known as quigli holes, are still in evidence today, so it's no surprise that we're rediscovering this method of creating the perfect environment. Take a page out of indigenous peoples playbooks, and look at how many animals also make their homes underground. In a soil that has enough clay in it to hold its shape, as well as a good mixture of sand to make for easy digging, a wonderful warm burrow makes a great home. Looking for a cheap (almost free) way of installing air conditioning? Why not have passive cooling?